How did you come upon the Project Reclamation installation? Holly told me about it. I was eager to help my home town. What were your reactions/feelings as you viewed it? Any other stories from that event? Honestly, after spending a few days in Joplin, cleaning up my parents house and helping the neighbors, the stuff in the gallery looked very clean and safe. One thing you notice in the disaster zone and surrounding areas is the random danger lurking everywhere. Broken glass, nails, sheet metal, etc. Once it is put in the gallery is appears more organized and calm. Describe why you chose the debris you chose, and what you are doing/will do with it. Lastly, could you finish this sentence: "I am for an art....."
I chose a few pieces of wood that I could paint on. One particular piece was wavy and it reminded me of wind and water, so I painted a seaside sunrise on it. The rising sun always makes me appreciate a new beginning, and the sea is very calming. I thought it would be a good transformation. 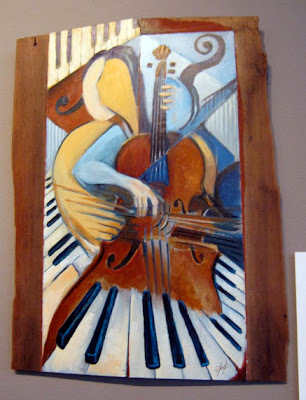 On another, I painted a cubist inspired cello playing over a broken piano keyboard. 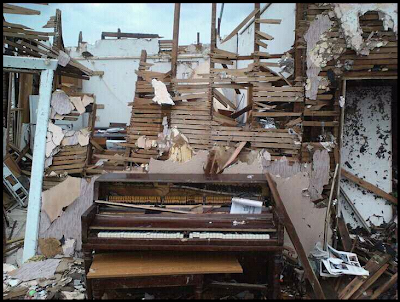 One of the images my cousins shared with me was of my Aunt & Uncle's home, just shredded to pieces. But right in the middle was their poor piano, hardly moved, but completely ruined. I call it "Requiem For a Piano". And on the smallest, square piece I painted the Hindu God, Shiva the Destroyer. They believe that Shiva holds the powers of the universe in his destructive dance and when he is done, the universe will be replaced by a new one. The path of the tornado made the landscape I had known for decades look like another planet. I think that Joplin is going to look like a new city when the rebuilding is complete. I am for an art that transcends time and place. I like to think the act of creation is more important than the final product. I hope that Spiva can help many people take the time to just create something new and forget about the stress of the past. Phil's my artist! I got the sunrise piece and can't wait to hang in in my new home. And I love knowing that he's from Joplin too. 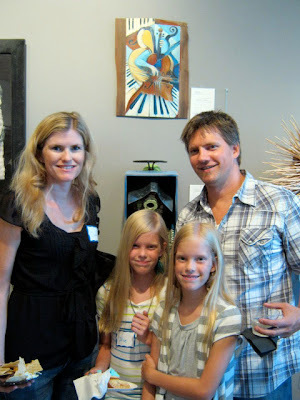 Fun to meet you and your lovely family at Twist and Shout Phil! Phil your art is truly inspiring. Thank you for using the picture of my parents' piano in it. I have many more pictures if you ever need them for your art.